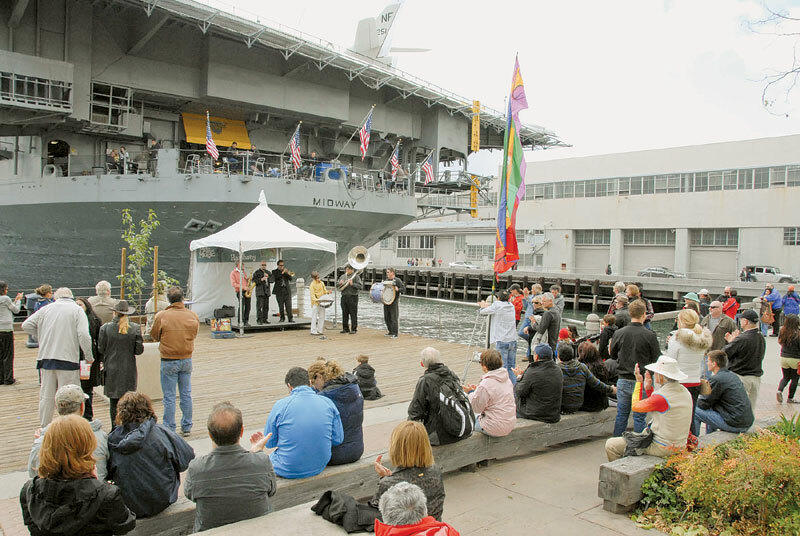 SAN DIEGO — Despite threatening clouds that occasionally brought scattered showers, San Diego’s Bay’s inaugural “Mile of Music” festival went off without a hitch April 14, bringing nearly 30 musical groups to the water’s edge along North Harbor Drive. Visitors to San Diego’s North Embarcadero were treated to a range of music performed Saturday afternoon, with different locations hosting different music styles. Port of San Diego community services manager Jim Hutzelman said he was pleased with the inaugural event, despite the inclement weather. “We received many high compliments on the uniqueness of the event, the quality of the music and the ‘coolness’ factor of having the event on the waterfront of San Diego Bay,” Hutzelman said. As part of the Port of San Diego’s recently developed Waterfront Activation Plan, the Mile of Music was the first pure-music event of its kind to be held along the waterfront, and it one of many that are being developed by the port and its consulting firm, Public Works Inc. Since the activation plan was released last year, the port has held events such as “Mambo on the Bay,” a mambo and salsa dance party at Cesar Chavez Park in August 2011; and “Fall for the Arts,” a sampling of more than 100 art and culture offerings from throughout the San Diego region that was held in October 2011. The seven music locations for the Mile of Music event stretched from Grape Street south to Tuna Harbor Park, just south of the USS Midway Museum. Musicians showcasing maritime, Latin, Brazilian, steel drum, West African, jazz, blues, folk rock, pop, Middle Eastern drumming and even barbershop quartet music performed for the festival, giving attendees a wide array of choices for all musical tastes. Public Works Inc. has produced music events in New York and Santa Monica. For San Diego, the company has more plans for the year, including a “Big Bay Boot Camp” coming May 20, featuring fitness classes and similar offerings on the waterfront of all five Port of San Diego cities; and “Big Bay Ballroom,” a series of waterfront dance events on the five city waterfronts, planned for August.